The goal of the series will be to close the gap between brief, real-time social media updates and the more detailed content which normally appears on Go Backpacking. The information will be a combination of tips received from friends and readers, travelers I've met along the way, and my own online research. In order to get the information out as quickly as possible, these posts will be more informal, though I'll still aim to make them easy on the eyes. 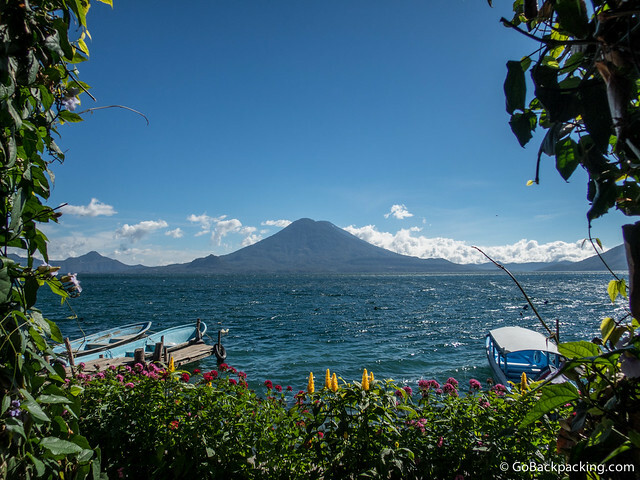 Kicking off the new series are my Guatemala travel tips. Let's get started. My flight arrived into Guatemala City, the largest Central American capital city, but I immediately left for Antigua. There's simply not much to see there. In the airport arrivals area, you can easily catch a 45-minute minivan shuttle to Antigua. The cost is $10 per person. If you do need to spend a night in Guatemala City, such as if you have an early flight to catch, or are in transit, a friend recommended Quetzalroo Hostel. 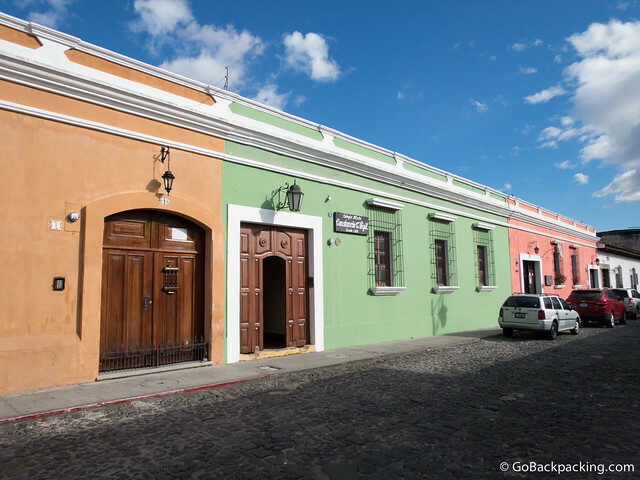 Antigua is a charming Spanish colonial city with cobblestone streets and volcano views. It's a UNESCO World Heritage Site, and the center of tourism for the entire country. Antigua attracts all kinds of tourists, from backpackers to luxury travelers. Organized trips can be arranged anywhere in Guatemala (including Flores/Tikal), as well as to Copan in Honduras, and the beaches of El Salvador. Probably Belize and Mexico too. El Hostal – Very popular with backpackers, so book ahead. WiFi. Hacia el Sur – Across the street from El Hostal, occupying the lower floor of the building with Sky Cafe. I spent three nights in a three-bed dorm and three nights in a private room with bath. The private room was a good deal for about $18/night. WiFi. Hector's Bistro – Very small, so you're better off trying to go for lunch instead of dinner. Ranks high on Tripadvisor. WiFi. Sobremesa – Try the artisanal ice cream flavors, like bacon chocolate and peanut butter coffee. They have a separate ice cream shop around the corner from the restaurant in case you don't want a full meal. WiFi. Cafe Sky – Known for their rooftop bar happy hour, but their food and WiFi are good too. I ate here several times since it was above my hostel, and a good value. Foreign owned. The Refugee Coffee Bar – Small, expat owned cafe. WiFi. Must see buildings/locations include: the Main Plaza, Cathedral de Santiago, La Merced (church), Arco de Santa Catalina, Convento Santa Clara (worth the price of admission), Casa Santo Domingo (hotel/restaurant/museum). Great city for photo walks in the early morning and at sunset. Watch sunset from Sky Cafe's rooftop bar. Chocolate tour at ChocoMuseo (well worth the $22). Visit Cerro Santo Domingo for views of the city and volcanoes (catch the free shuttle from Hotel Santo Domingo). There's also a restaurant up there (go early to get a table for breakfast), and a lot of cool outdoor sculptures. Take salsa or bachata lessons. There are several dance studios located around the historic center. Once called the “most beautiful lake in the world” by some dude, it's worth a visit if only for a night or two. It's a two and a half hour private shuttle (minivan) ride from Antigua, so it could even be done as a long day trip if you're pressed for time. There are 14 towns around the lake, with the largest being Panajanchel (or “Pana” for short). This is where you'll find the most diversity with regard to restaurants, including a Japanese place, Mayan Vietnamese fusion place, and several good coffee shops. The backpacker favorite is a village called San Pedro de Laguna, which takes four hours to reach from Antigua, the last sixty to ninety minutes being on steep, dirt roads leading down to the lakeside. The view from San Pedro is boring because the volcanoes are behind you. I preferred the view from Panajanchel, which allows you to see all three peaks from across the lake. Sunsets are also prettier from Pana. I went from Antigua to San Pedro for a night, then took the boat thirty minutes across the lake to Pana for another two nights, where I hung out with Leif from The Runaway Guide. It has a nice little pool and bar at the lake's edge. It's known as a party hostel, but most of the rooms are located far enough from the bar that noise shouldn't be an issue. I couldn't find a way to book online in advance, and lucked out by getting the last private room for the night I arrived. There's not much to choose from in Pana, so I took a room at the place Leif was staying a ten minute tuk tuk ride out-of-town. It was a proper lodge, with much better views of the volcanoes, lake and sunset then you can get in town. Some units have kitchens. I paid $25/night. WiFi, but the signal was very weak when I was there. I visited this hostel on a day trip from Pana with Leif and his friend. If I had more time, I'd have liked to spend a night here. The views are stunning, and it's super laid back. This is more my style than San Pedro these days. No WiFi. The Buddha's rooftop is chill, plus plenty of Asian style food. Nick's Place by the boat offers good views, especially in the mornings. Buy a loaf of homemade chocolate banana bread from the local women in the streets–delicious and cheap! Shanti Shanti offers nice views of the lake and cheap specials. Pana Rock is the local rock bar, and it's rumored to have the best pizza in town, but the oven wasn't working when we went there. The burgers were OK. Live music nightly, fun atmosphere. Cafe Kitsch is a German bakery on the main street. Lots of chocolates and pastries. Cafe Loco, also on the main street, is owned by two Korean guys. It's small, but with a good vibe, and locally grown coffee. Cafe Sabor Crucero is a student run cafe offering excellent food, service, views, and value. WiFi too! I recommend people visit and support the good cause, wherever they are staying on Lake Atitlan. Relax. Get in touch with your inner hippie. Day trip to the various villages around the lake. I took a private shuttle from Antigua to Lanquin, the closest town to Semuc Champey. The road is paved the whole way. I think it took about five hours. There's not much to look at in Lanquin, and most people eat meals at their accommodation. Literally a few meters from the park entrance. It requires taking an hour's ride off-road after the shuttle lets you off in Lanquin, but this would've been my preference. You're right on the river, and you can get to the pools immediately after the park opens (when you can hopefully have them to yourself for a little bit). No WiFi or Claro signal. Party hostel. You either love it or hate it. Situated in a valley in town, it has nice views, but they blast rock and alternative music all day and night, so it's not that relaxing around the common/dining/bar area. A guy was stung by a scorpion while laying in bed the night before I arrived. Worse for me was hearing rats running through the rafters at night in the dorm room. I had trouble sleeping as a result. Good food. Extremely limited WiFi (no more than five people at a time), but signal for Claro 3G is solid. $7.50/night for a dorm bed. Absolutely beautiful. There's no need to hire a guide. You can walk up to the viewpoint on your own. It's a marked trail, takes 25 minutes to get up, and the same to get back down. Try and get to the pools as early as possible to avoid a crowd. I went on a Sunday and there were a lot of Guatemalan families there too. The families stick around the shallower pools, so you can always go to the deeper ones instead. I skipped the rock slides. A lot of people do a candlelit cave experience as part of a full day tour to Semuc Champey. One Israeli I met who did this said he was so tired from the caving, and subsequent cliff jumps and rope swing that he didn't have much energy to enjoy the natural pools. To me, this is backwards. I say skip the cave. Another cave option is the bat cave, which is visited at sunset so you can watch them all fly out (watch out for guaro). There's Class III and IV rapids. People who went from Zephyr said it was fun, and the difficult sections were brief. Drink beer while floating down the river. It was a long travel day from Lanquin to Livingston. First, I took a private shuttle ($19) arranged through Zephyr Lodge to the town of Rio Dulce. The first two and a half hours were off-road, and very bumpy. Once we hit pavement, it was smooth sailing. Then, I took a boat ride ($16) from Rio Dulce to Livingston. It was windy, so I got soaked on the boat ride down the river. Thankfully none of my belongings got wet. Be prepared in case it's windy or raining. The boats don't have side flaps that can be rolled down from the roof, so it's easy for the water to splash in if the water is rough. The scenery along the ride was nice, but nothing spectacular. Lots of birds. I was so tired by the time I arrived, I checked myself into Hotel Villa Caribe, one of the best hotels in town. It was low season, so it was about half the price. Casa de la Iguana – Super budget hostel. This is the place they recommended to me at Zephyr. I stopped by, but it was not at all appealing. Had some bungalows (and dorms I think) around a grassy area, but it looked swampy and ghetto. Hotel Casa Rosada – This is the mid-range place I would've stayed had I not splurged. Bungalows are $20/night, and this applies to solo travelers too. Hotel Villa Caribe – I paid $65/night, which included a breakfast buffet with a view of the river. All the rooms have river/sea views. The pool was gigantic, and the landscaping is pretty. Fast Wifi, especially in the restaurant. Worth the money if you want to splurge. MC Tropic – I had both my dinners here. Try the Garifuna soup, a local specialty. Casa Nostra – Excellent thin crust pizza. I had the shrimp pizza with tomatoes, onions and peppers and it was decadent. Hang out…. this is the Caribbean after all. There are some beaches and day tours, but nothing appealed to me. 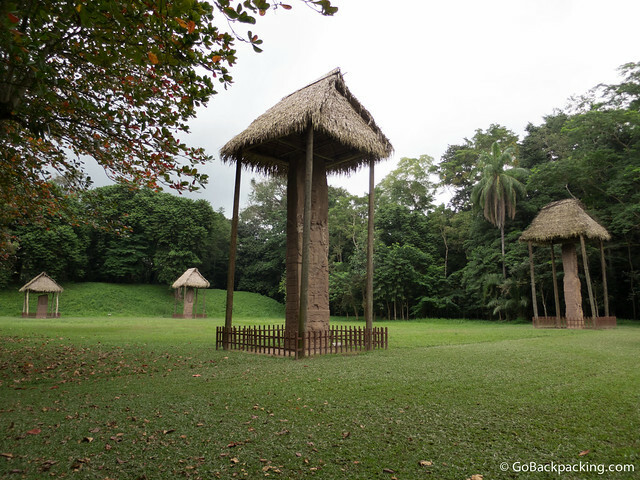 Quirigua is home to the Maya world's largest stone stelae, which is 10 meters tall and weighs over 60 tons. The park requires no more than 30 to 60 minutes to see. It's a minor site, and I'd only recommend Quirigua to archaeological geeks, and UNESCO World Heritage Site nerds. 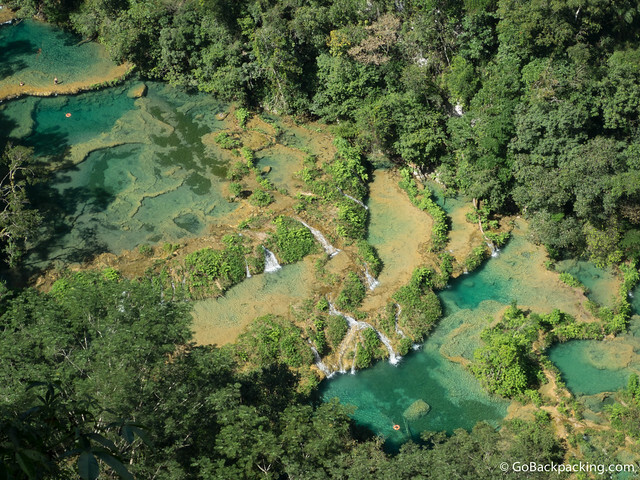 It's Guatemala's lesser known UNESCO site, after the more popular Antigua and Tikal. From Livingston, you travel via all forms of land transport in Guatemala. 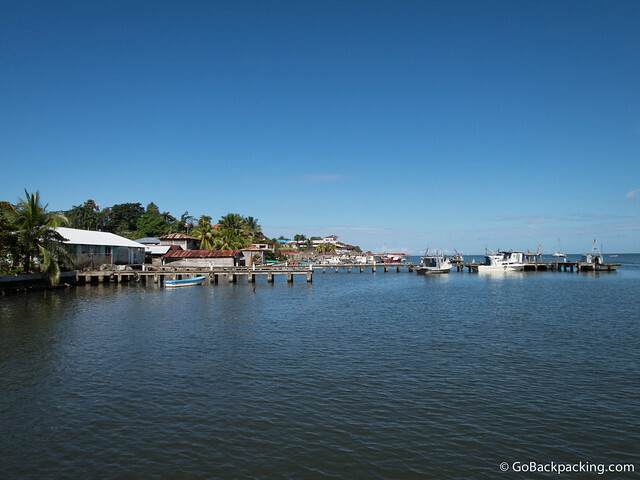 Start with a 6:30 AM sunrise boat trip to Puerto Barrios, before catching a bus south to Quirigua. Tell the driver where you're going. He'll then leave you at the right spot on the highway near Quirigua. You then need to hail a tuk tuk and take it about 10 minutes to the park entrance. After you walk the site, to get back on your way, you need to catch a colectivo leaving the banana plantation adjacent the park. That drops you off at the main bus stop along the highway in the nearby town of Los Amates. From there, catch a bus heading to the town of Chiquimula. In Chiquimula, transfer to a colectivo heading for the border (in Spanish, “la frontera”). The border crossing was easy. Just stop at the office on the Guatemala side for your exit stamp, and then walk across and get stamped in Honduras' Immigration office. There's a fee of a few dollars charged to enter Honduras. Once you get your entry stamp, walk another 50 meters or so up the road, and wait for a colectivo to Copan Ruinas. It's only 10 kilometers away. If it's getting late in the day, it's probably best to spend the night in Chiquimula, before getting an early start the next day. The border closes at 6 PM. Did you find this information helpful? Let me know in the Comments below. Thanks for the notes. I’m headed to Guatemala in April and appreciate the firsthand advice. That’s a great guide Dave! It’s remarkable how much you discovered in your time frame. Thanks for the support as well! I’m working on uploading those pictures to a drop box but it’s proving frustrating with this darn internet. Glad we had a few nights to hang out, and thanks for the pics! I figured everyone would like Antigua, but there’s no denying it’s touristy. That’s why I mentioned the city attracts all levels of travelers, from budget to luxury. Still, I felt as though I was getting good value for my money, at least in the restaurants. Dave you done great! Its helpful for travelers. Keep it up..
Nice overviews! Utopia Eco Lodge is a great place in Lanquín, too. The ambiance is a nice meeting point between the loud & crazy Zephyr and the family vacation style El Portal. I really liked Antigua, I found it easy to avoid the touristy places and hang out with locals, if that’s your thing. I also found it very relaxing. I was there for 5 weeks and traveling on a budget. I would love to go back! Met some fantastic friends there.